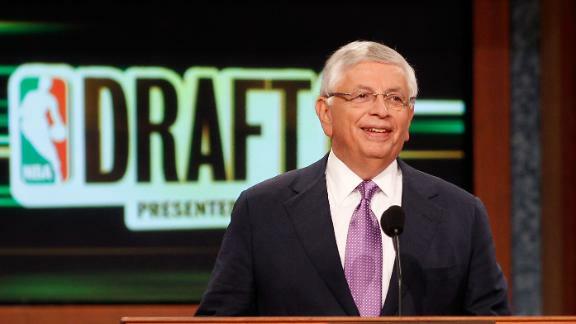 Tonights NBA Draft will be full of trades, surprises, and hopefully a few future stars. Despite the unpredictability of such an event, we will try to forecast the outcome as accurately as possible. Here is our mock draft, put together by my good friend Ben Tenzer. Analysis: Rumors have been building since the Cavs won the lottery that Len was growing on them more and more. At the end of the day, Len and Noel both are unproven projects at the college level, but Len is coming off of a less severe injury and he has one inch and 20 pounds on Noel. They could end up going either way though, and if the offer is right the Cavs would certainly consider trading the pick, but I think that come Thursday, Len will be the Cavs’ man. Analysis: ESPN’s hype machine has pulled off its magic (no pun intended) yet again. Even though Victor Oladipo’s offensive upside is limited at best (though his defense seems to be a sure bet), ESPN and other media analysts have been talking him up to be the next D-Wade, proving that people forget D-Wade had a jumpshot. The truth is that Oladipo will be a fine NBA player, but will almost certainly not live up to his hype due to his limited offensive range. However, he has been hyped up to the point where either the Magic will take him or another team will trade up to this spot and will (Magic GM Rob Hennigan reportedly said that “3-4 teams” were in negotiations with the Magic for the pick). I will say, however, that if Oladipo develops a jumpshot and some quicker hands on offense, he has the potential to be very good. Analysis: Team needs a SF, player has played in team’s arena for 3 years, player will at worst be a solid starter but has potential to be much much more. This pick is a textbook no-brainer. Besides, Okafor and Nene can hold the fort down for another year if need be (and before you think it the Wizards have no incentive to bet on Noel, they want to match Beal and Wall with guaranteed talent while they’re still in town on small, guaranteed rookie contracts). Analysis: The Bobcats are full of projects, (see: Michael Kidd Gilchrist, Bismack Biyombo) and aren’t going to make the playoffs no matter who they draft here, why not go for the most upside available while allowing the 6’9 Biyombo to try out the PF position? Analysis: Wesley Johnson isn’t the SG of the future on this team and Goran Dragic/Kendall Marshall are fine in the PG slot. McLemore definitely has the offensive tools to be great, however his attitude has been questioned so strongly that he has fallen in range from top 3 to 3-6 range (larger than in sounds). Phoenix has their frountcourt in order for the time being (Morris twins, Scola, Gortat) and can majorly benefit if McLemore pans out. Analysis: The Pelicans draft a PF with high upside and an NBA ready body (6’8, 240 pounds). Bennet could also provide a fantastic 1-2 punch in the frontcourt with Anthony “The Brow of Justice” Davis. Analysis: The Kings passing up a guard in the high first round? Such an egregious departure from character likely wont happen again after last years’ disastrous Thomas Robinson fiasco. Despite a relatively poor draft history, I think that the new ownership will stumble upon a gem in Trey Burke, a prospect who could go as high as 2, because Burke has NBA guard speed and dribbling ability now. He’s a little undersized, but so is Isaiah Thomas v2.0 and he starts for the Kings. I think that if Burke develops his defense and intangibles slightly more he could prove a lot of people wrong. Analysis: LILLARD ALERT!!! LILLARD ALERT!!! LILLARD ALERT!!! This kid, out of Patriot League Powerhouse Lehigh, is so similar to Damian Lillard, a comparison which is not lost in Lillard, who as acted as a sort of mentor for McCollum. CJ has the tools and the relative size to be exactly like Damian was last year, but he has the same knocks as Damian (didn’t prove himself against quality opponents) and he’s coming off of an injury, but I see McCollum as the PG of the future for the pistons. Look for Detroit to pick Trey Burke if McCollum is gone. Analysis: Caldwell-Pope is a kid who you probably didn’t know about unless you’re an SEC fan, but he is the exact type of all-around shooting guard with a sweet jumpshot that David Kahn would love to use in a pair with Ricky Rubio. There is a general consensus growing among league sources that if Caldwell-Pope is there at 9, he’s going to the wolves. Analysis: With Lamarcus Aldrige making a stink about leaving to play somewhere else and with the general instability of JJ Hickson I would have to say that the Blazers have to draft a center. Zeller is a physical specimen who has the physical tools for greatness, but I question whether or not he can actually learn the many skills he needs to to be a quality player in this league. At worst, I can see him being similar to Tyler Hansbrough. Analysis: The Sixers need talent, Carter-Williams is widely perceived to have the most upside at this point in the draft. In my opinion he is a trash player with no offensive game (just insane athletic ability) and no defensive game (just good at steals) who went to a trash university (he hasn’t been playing and defense but Zone for the past 2 years). I don’t think it’s the right pick, but I think it will be the Sixers pick. Analysis: Adams is a smart, quality player who doesn’t have great potential, but who can step in right away (7’0 255 pounds) and contribute, a classic Thunder pick. Analysis: Mavs want to stash player in Europe for cap purposes, Karasev is best Euro player on board. 2+2=Karasev. Analysis: The Jazz need a PG very badly, Shane Larkin is the best PG on the board and I’d wager that though he doesn’t have too much size or room to build, he could start on this Jazz team opening day. Analysis: The Bucks need a guard badly and have proven in the past (Jennings) that they aren’t afraid to draft a player from overseas. Schroeder is the best mix of talent and potential left on the board and the guard position. Analysis: After what can only be referred to as the Rivers fiasco, the Celtics pushed themselves into a new era of rebuilding. What better bet to take for a team ready to lose than Shabazz Muhammad outside the lottery? Last year’s #2 prospect out of highschool and pre-season top 5 pick consensus has been pummeled with off-the court issues over the past year, but still has tools to be more than great. There is simply nobody better for the Celtics to choose at this spot than Shabazz. Analysis: Giannis (I’m not going to attempt to type his last name) is a hit or miss prospect who will be stashed in Europe for the next few years. He has received a first round promise from an unknown team and considering that the Hawks have two consecutive picks, I’d bet they’ll stash one for salary purposes, goes without saying that he could also be picked 18th. Analysis: Bullock steps in as a wing that will add some nice size to this hawks roster while also providing an extra soring threat, which is nice. Analysis: After picking Len, the Cavs could go for a forward who can score. While Plumlee may not provide the complete package, he certainly does fit the profile of scoring forward. Analysis: After being ravaged by injuries and with Boozer’s time on the chopping block fast approaching (Amnesty is still available for the Bulls) the Bulls could really use a big to step in and play some D for them right now, which Dieng provides. Analysis: After picking a PG earlier in the round I see the Jazz picking for potential by going with the guy who has an astounding 9’7 standing reach. Analysis: The Nets need interior defense badly. Though they could just count on Brook Lopez improving this summer after playing in the WNBA, the fact of the matter is that they need some sort of presence in the interior, which even the vastly overrated Olynk provides at the most basic level (7’0 234 pounds of defensive interior). Analysis: If George Hill’s concussion against the Knicks proved anything, it’s that the pacers are thin at PG and you can’t count on Lance Stephenson forever, So I see the Pacers taking a chance on a talented kid in Myack Kabongo. Analysis: The Knicks are plagued this summer with the likely loss of JR Smith, Pablo Prigioni, Jason Kidd, and James White (Maybe not plagued with loss of James White) leaving them with no depth at SG at all. JR’s cold streak in the playoffs proved that the Knicks need another scoring option badly, Allen Crabbe out of UCLA is a shooter who fills both of those criteria. Though it would be nice for the team to get a big like Jeff Whithey or a true project like Ricky Ledo, Crabbe has to be the pick. Analysis: The Clippers need to win now. Hardaway Jr. has a low ceiling but can play now and he’s the kind of hard worker that you’re going to receive a solidly consistent effort from. Analysis: Mitchell has Wolves written all over him. For a team who plays Derrick Williams at PF, Mitchell’s high ceiling and fantastic physical tools is perfectly worth the small-school risk at this point in the draft. Analysis: The Nuggets miss Aaron Afflalo and Franklin is the best SG in the draft at this point. His toughness and athleticism would complement Faried perfectly, but he doesn’t really have a shot yet. Think of this kid as a swall Kawhi Leonard. Analysis: “Bebe”, as he’s known in Brazil, is a lanky prospect who has been in the eyes of NBA scouts for over two years, and is so similar to Nerlens Noel as a prospect that not only is it creepy, but it also makes him a perfect candidate to be a Spurs foreign potential pick (See: Ginobli, Splitter, Parker) and gives the Spurs the opportunity to one day have the great Brazilian frontcourt with Splitter and Bebe. This represents a large slide for Bebe as some mock drafts have him in the late teens. Analysis: The 2013 NBA Draft’s feel good story is of Glen Rice, a player who spurned Europe for the D-League and worked his way up from playing an average of 10 minutes a game to the D-League All-Star team. He’s the kind of hard-working player who just fits in seamlessly with the Thunder, who have no big needs to tend to besides just adding more talent. Analysis: The Suns could always use a little something extra at big man and Mike Muscala, who has carried Patriot League champs Bucknell on his back for four years, is just the kind of hard working, full bodied PF/C combo who can provide some solid bench minutes right away for any team. This entry was posted in Articles and tagged KNICKS MEMES, mock draft, mock draft 2013, nba draft, nba draft 2013, nba mock draft, nba mock draft 2013 on June 27, 2013 by Tommy Rothman.